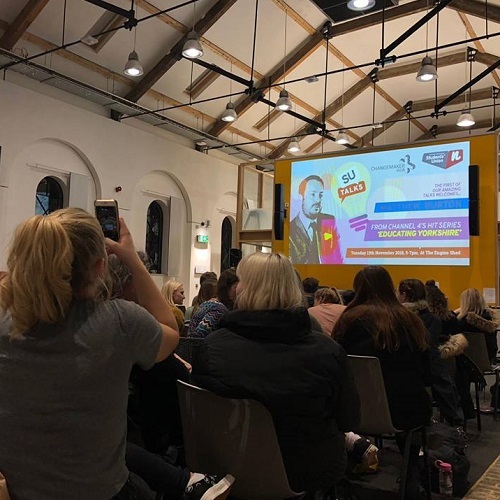 The Students’ Union was delighted to welcome Matthew Burton from the hit Channel 4 show ‘Educating Yorkshire’ to launch our brand new, hard-hitting programme of guest speakers, SU Talks, last night. Seats were sparse as around 100 students filled the Engine Shed to listen to an hour of motivational tips and tricks on how to educate students pastorally, as well as academically. Matthew injected his energy and passion for teaching into the current generation of University of Northampton students. He spoke in depth about what humans are capable of as teachers using interactive techniques within his speech to keep attendees engaged. During this time, he noticed one of his former pupils, who now studies at the University of Northampton, among the audience – something which came as a pleasant surprise to him and was lovely to witness! After delivering his talk, Matthew took part in a Q&A session, hosted by Ryan Bradshaw, your Vice President: Union Development. Ryan firstly took to Twitter, where students had submitted questions using the hashtag #SUTalks, mainly regarding the reasons why he was inspired to teach and how he manages to engage students in the classroom. As a headteacher with previous experience of being deputy headteacher specialising in pastoral care, Matthew offered his thoughts on how to achieve his key goals - attendance and behaviour, with classroom etiquette following naturally (which he names the ABC technique). Questions were also taken from the floor, which included how to deal with issues that prevent teachers from being their best. On this point, Matthew mentioned funding cuts and welfare opportunities, particularly for younger students, and explained that it is important to have a list of what to be, not what to do, as a teacher to drive you through difficult circumstances. The evening concluded with a clip of when Matthew helped former student Musharaf overcome his stammer by listening to music through headphones while speaking – an idea featured in the movie, The King’s Speech. It demonstrated how Matthew uses his experiences in life to pass on to his students, providing them with ways to climb over any barriers they are facing. This, in turn, was sure to motivate our students to do the same. SU Talks will return in January, with an exciting guest to be announced!